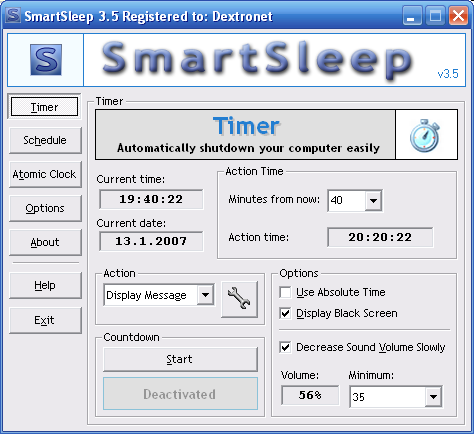 SmartSleep is a new and free to try utility for shutting down your computer at a specified time. You can also schedule these tasks, so it can turn off your PC every Sunday at 18:00 and so on. However, SmartSleep can do way more than that! SmartSleep supports these operations: Shutdown, Log Off, Reboot, Black Screen, suspend, Hibernate, File Execution and Display Message. The shutdown utility has some really neat functions - you may display black screen during countdown so you can save the life of your monitor. It's also possible to slowly reduce the speaker volume, so if you are listening to music or watching films before falling asleep, you will love this. With SmartSleep you may force all applications to quit during shutdown, even those which aren't responding, so it will turn off your PC always. You also can select program which will be executed before shutdown. Unlike in many other applications, you may set-up date and seconds, so PC is turned off exactly when you want. Combined with Atomic Clock Synchronization feature, the shutdown time is always very accurate. SmartSleep has a clear and easy to use interface that supports minimizing to system tray. It can be launched automatically at system startup and remembers everything you set it too. You may set-up time by absolute time (16:30:26) or by relative time (12 minutes from now). Shutdown scheduling is very powerful. Tasks can be performed once, every day, or on specified days (Monday and Thursday, only weekends, all days expect Friday etc). You may easily turn scheduling on/off in options and individual tasks can be turned on/off with checkboxes upon them. For example, you may set 'lunch reminder' to 12:00 every day except the weekend, start program to clear your system at Sunday 21:00 and turn off your PC at 22:00 every weekend. You can turn on shutdown confirmation window with timeout to prevent accidents.